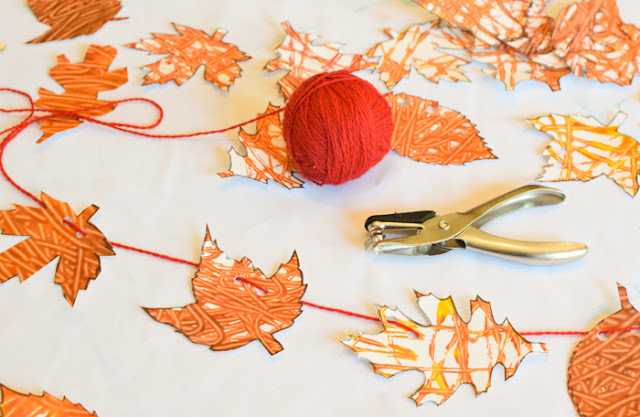 Still looking for some fun autumn crafts for your kids to enjoy? This Marble Painted Leaf Garland is sure to please. 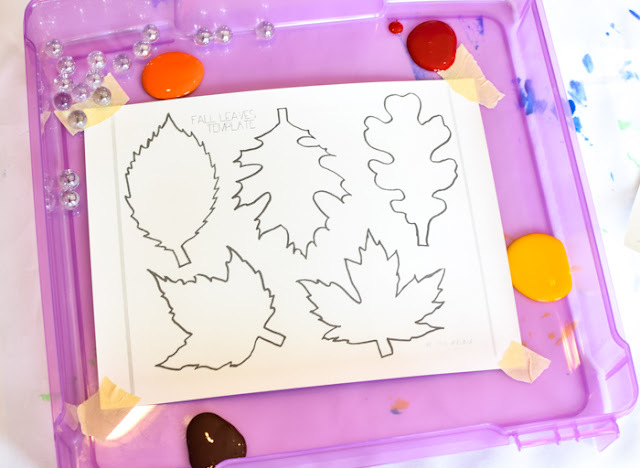 It starts with one of our favorite process art strategies and ends with a beautiful fall decoration that will spruce up your living room or a child's bedroom for the season! Here's how to make your own. 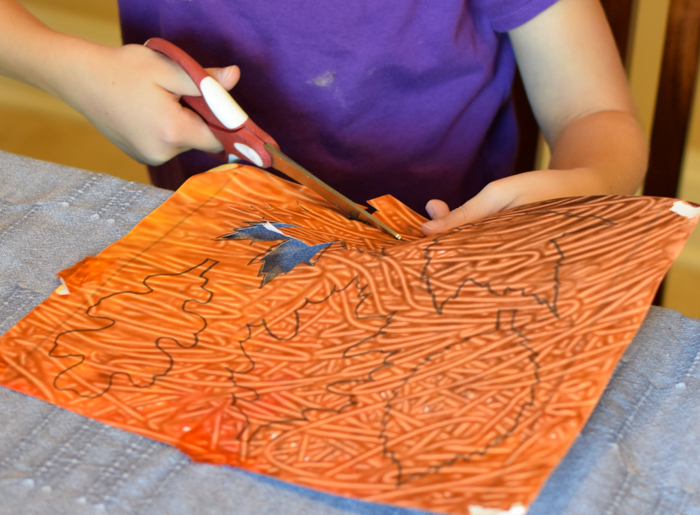 If your kids end up enjoying marble painting, be sure to check out how we painted pumpkins, apples, turkeys, and Christmas trees, too! Begin by painting your leaves. 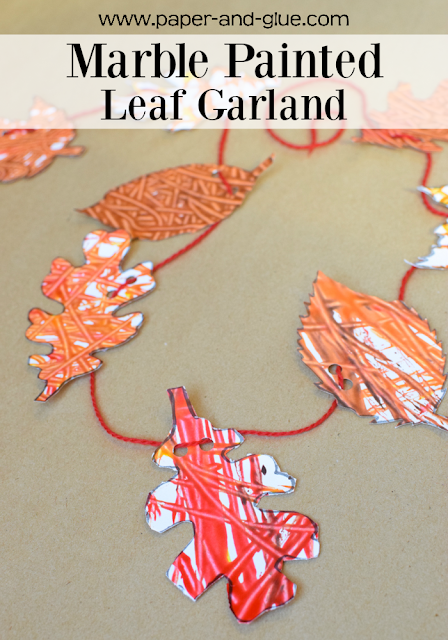 Print several copies of a leaf template on sturdy cardstock. I liked this one because it had a variety of leaf shapes on one page. Tape the paper inside of your box or box lid. We used half of a scrapbook paper storage box, but in the past we've also had success with a standard plastic storage box and even a cardboard Bankers Box. Anything will do! Squirt several small puddles of paint around the edge of the paper and drop in a few marbles. Let your children shake, rattle, and roll the marbles around. 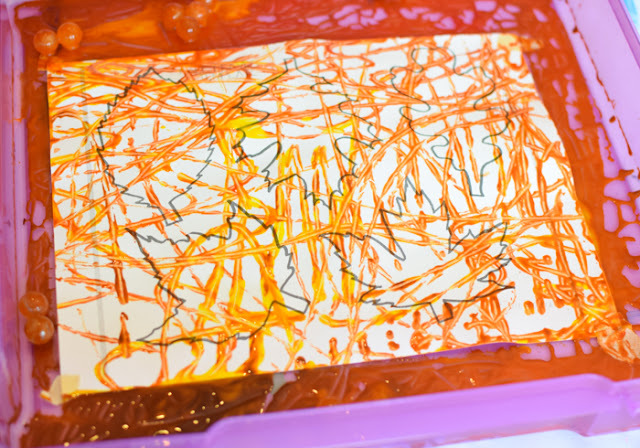 As they do, the marbles will pick up paint and slowly cover the page. Keep rolling until you've got the kind of coverage you like. 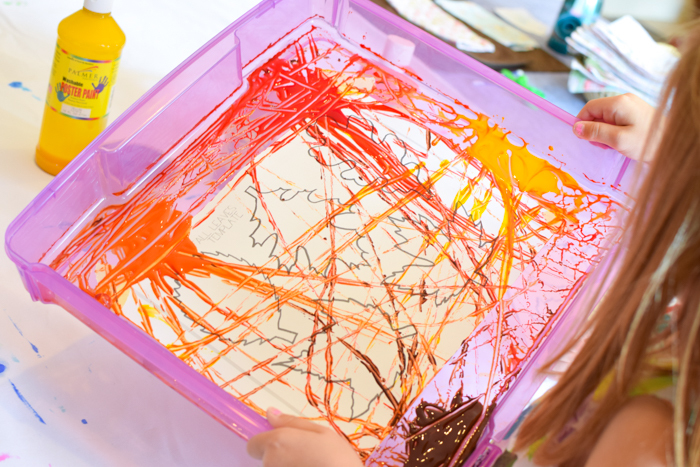 My oldest daughter likes to cover the ENTIRE page when we marble paint, so her papers always end up with the colors all mixed together with marble tracks running over them. Once you've painted several pages, set them aside to dry. Once your leaves have dried, it's time to cut them out. Some of these leaves can be tricky with all their little nooks and crannies. Lena was able to cut hers out on her own, but Maggie eventually wanted some help on hers. Make yourself a nice pile of leaves! Finally, grab a hole punch and punch two holes in each leaf, about 1 inch apart. We oriented our leaves in different directions, but you could also make them all with the stem up or the stem down. 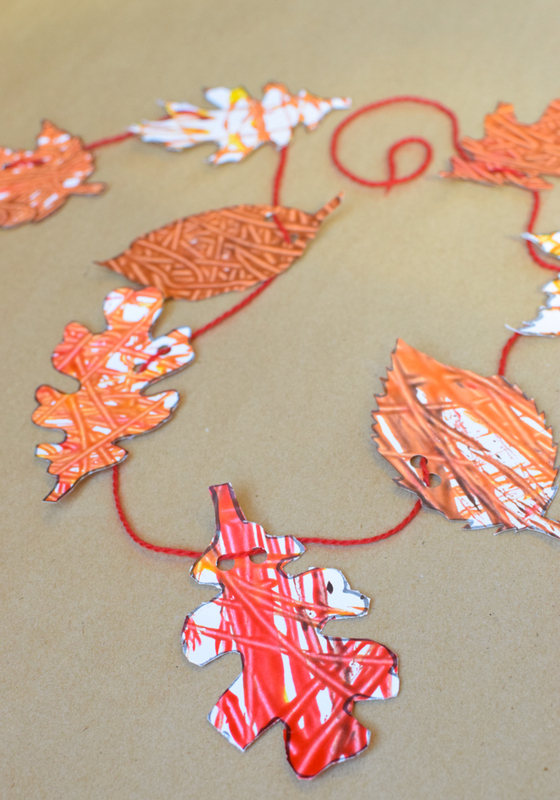 Thread a length of yarn through the leaves and you've got yourself a beautiful garland! 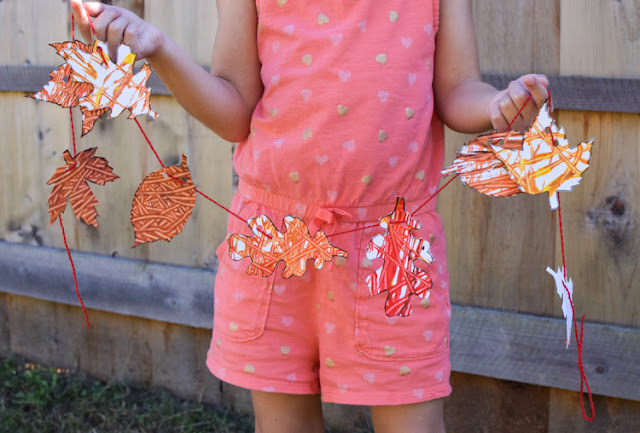 Easy fall craft for kids- Marble Painted Leaf Garland. Use this fun process art technique to make a pretty decoration for fall! Great activity for preschool, kindergarten, or elementary.